The Department of Homeland Security recently filed a proposal to remove an Obama-era rule that allows immigrant founders of companies in the US the opportunity to stay for two and a half years, with the possibility of an extension. It was a long time coming, considering the current administration’s push to enforce stricter and broader immigration laws to prevent any loopholes: Last year, the DHS delayed the effective date from July 2017 to March 2018, and announced it would ultimately remove it completely in order to protect the jobs of American workers. The announcement triggered comments from industry experts and professionals who say that rescinding the rule that protects immigrant founders will have the opposite of the intended effect. And as this chart from Statista shows, they’re right to think so. 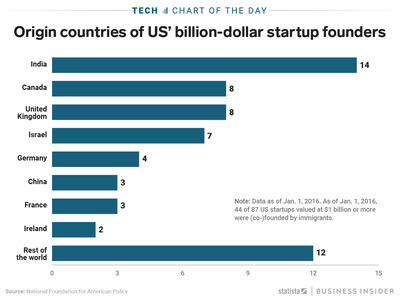 Immigrants have been a major part of the startup scene, creating jobs in the process. Combined, (co-)founders from other countries have created half of the billion-dollar startups that existed as of January 2016, each of which created an average of 760 jobs.